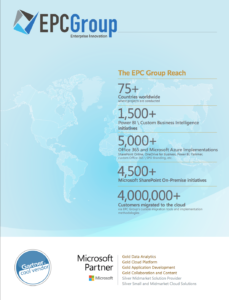 EPC Group provides mobility, BYOD, and mobile device management (MDM) consulting services that will help increase user adoption and open new possibilities to your organization’s user base that will increase the long-term success of your SharePoint 2019, Office 365, Microsoft Azure, or custom application development initiative. EPC Group will provide for a common user experience which is both device and browser agnostic. We deliver our time tested “from the consulting trenches” strategies and related policies for your organization which follow a Responsive Web Design (RWD) user interface (UI) design for your SharePoint 2019 or Office 365 sites, communities, and branding elements, as well as in all aspects of custom development. EPC Group’s SharePoint responsive web design (SPRWD) methodology, a SharePoint specific responsive design approach, will provide your organization’s users an optimal viewing experience with common “content reading areas” and device/browser agnostic navigation that will allow for functions such as panning, scrolling, and resizing across devices. If you are a large or global organization, or one that has users in multiple locations, in various countries, or possibly spread throughout the globe, EPC Group will provide you with a user experience and related responsive web design from a “device channel” perspective to ensure seamless mobile device management. “Remote workers” as well as “internal/onsite workers” empowered with “bring your own device” (BYOD) policies can push the boundaries of IT and the typical IT-driven culture. EPC Group will enable your organization’s users to security access content stored within your SharePoint 2019/Office 365 environments or ECM platform regardless of the remote working environment. EPC Group also offer integrated solutions that can be implemented on your existing infrastructure around device locking as well as remote wiping if a device is lost or stolen and for secure backups, certificate/encryption and virus protection.